Sometimes, it's hard to choose between a beer or the hard stuff. But now Guinness fans can make merry: Diageo -- the liquor mega-brand which owns the beer -- is set to launch a new whiskey made on the site of a former Guinness factory. They're calling the blended Irish booze Roe & Co, and it's set to arrive in select European markets just in time for St. Paddy's Day. It'll have competition, as it's squaring up to go toe to toe with Pernod Ricard's Jameson, the world juggernaut of Irish whiskies. If you're in Europe over the next few weeks, you'll be among the first to sample the new offering, which was blended by Caroline Martin, Diageo's master blender, who was also responsible for blending the company's J&B and Bell's blended scotch whiskies. Large-scale production for drinkers around the world is still two years away according to VinePair, as the company needs time to get its distillery up and running. "On the nose [Roe & Co] is creamy, delightfully fragrant and remarkably rounded with notes of soft spice and mellow spun sugar along with warm hints of woody vanilla. The quality and perfect balance of the blend is immediately apparent on the palate through its velvety texture and sweet flavours including spiced pears and vanilla. The finish is lingering and gentle, ending with a light creaminess. 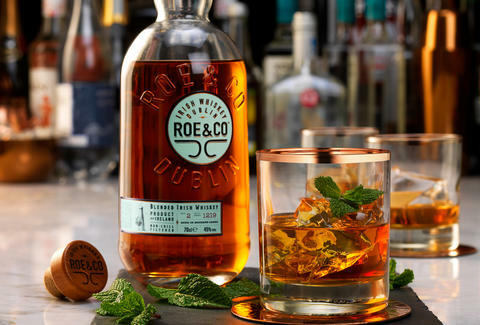 The sweet pear notes readily apparent in Roe & Co are a wonderfully apt tribute to the once-great Dublin whisky distillery of George Roe & Co. Among the remnants of George Roe’s distillery are its old windmill tower, known as St. Patrick’s, and a magnificent pear tree dating from 1850." Eric Vilas-Boas is writer and editor at Thrillist. Follow him @e_vb_.